Wholesale Weekly Medicine Trays - Personalized or Blank. Economy wholesale weekly medicine trays with 28 compartments and your custom imprint. These custom medicine trays are ideal pharmacist and doctor gifts. Budget Prices in USA and Canada for bulk personalized medicine trays . American clients pay no taxes. Prices include your 1-color custom imprint. Please use next-column pricing for wholesale blank (not imprinted) pill organizers. Additional Imprint Colors: add $0.20 per medicine tray. 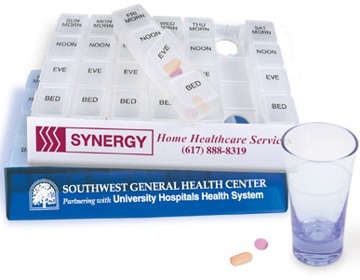 - The medicine tray makes it easy to schedule and guide correct dosages for a week-long period. - 4 compartments per day, marked: Morning, Noon, Evening and Bed. - Colors: White Base with Translucent Clear Pill Boxes (as shown), White Base with Translucent Pink Pill Boxes, White Base with Translucent Blue Pill Boxes. - Product Size: 5" x 6 3/4" x 7/8"
- Production: 10 Working Days . Contact us for faster production. Note: The Plastic Base is equipped with convenient, easy-to-use holes for facilitating pill box removal.